For my In / Out list back in January, I declared heirloom grains "in." I don't think I was wrong. I'm seeing lots of recipes for grains other than your typical rices and wheat varieties. This soup appeared in the January issue of Bon Appétit as part of their "new healthy" theme. Spelt is an ancient variety of wheat native to Southern Europe where it's long been a staple. According to The New Food Lover's Companion it has a slightly higher protein content than typical wheat. 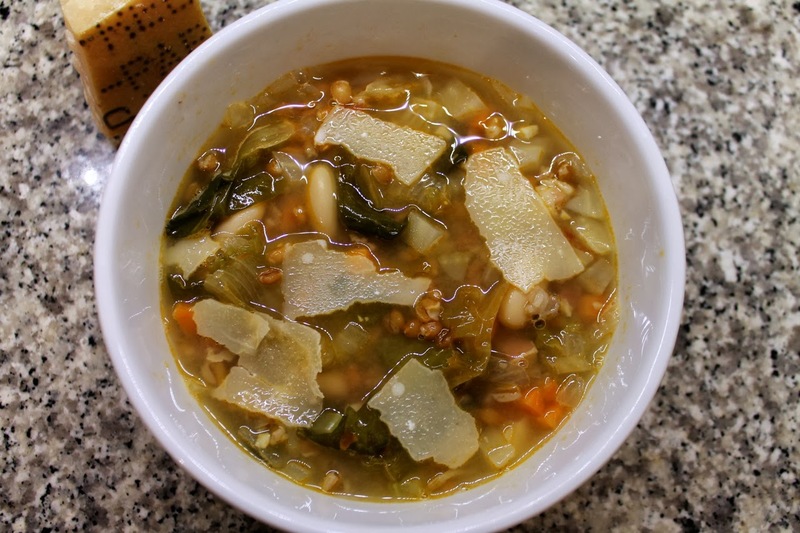 I loved the grain's chewy texture in this soup, which also features escarole, another under-appreciated ingredient, plus cannellini beans. I think you could easily make this vegetarian by omitting the pancetta and using vegetable broth. We ate this during last week's snowstorm, and it hit the spot. 1. Heat olive oil in a large Dutch oven or soup pot over medium-high heat. Add pancetta and cook, stirring often until golden-brown, about 3 to 5 minutes. Add spelt and cook, stirring frequently, until grains have toasted a bit, about 3 to 5 minutes. 2. Add onion, fennel, carrot, celery and garlic to pot and season with salt and pepper. Sauté vegetables until softened, about 6 to 8 minutes. Add tomato paste, and red chili pepper flakes and cook another minute. 3. Add broth to the pot and bring mixture to a boil. Reduce heat and simmer until the spelt is tender, about an hour. Stir in the escarole and beans and cook until the escarole is wilted, about 5 minutes. Serve soup in bowls topped with a few fresh shavings of parmesan cheese. Who knew I loved spelt? I look forward to seeing it cross our table again soon.